A few years ago, I was introduced to a little four-letter acronym that put a name to a feeling I was all too familiar with: FOMO. The Fear Of Missing Out. Turned out, it wasn’t just me who felt a stab of sadness when there was a dinner I wasn’t invited to… even if it was a dinner I didn’t particularly want to attend, I still felt sad to not be invited. FOMO hits when friends I like hang out with each other without me. FOMO strikes when I see pictures on instagram of happy groups at the theater, at the park, on vacation. Finding out that FOMO had a name—that it was a thing‑made me take a harder look at this phenomenon, and why it is that I compare my messiest self with others’ glossiest online presence. The twin beasts of comparison and envy lurk close by, and as one friend recently said: Social Media is like Miracle-Gro for envy. I recently got to attend a writers’ conference: a FEAST of a festival, with speakers and professionals and an abundance of online friends there in person. More than a few of my writer friends expressed their great sadness that they couldn’t go: “I’m going to have to stay off the internet for a week to keep the FOMO at bay,” wrote one. Wanting to be sensitive to those same feelings of loss that I experienced, I kept fairly quiet about the fact that I’d be attending. I didn’t live tweet each session. I didn’t post pictures of all the wonderful people I saw. FOMO is a thing, and I didn’t want to kindle it. I got to go. I didn’t miss out. But here’s the thing: at the end of the first day I had a creeping sense of loss and sadness, and it took me a couple of hours to figure out what it was: my old nemesis FOMO, right there with me. After fifteen hours of constant interaction and input on that first day, I found myself strangely sad about all the conversations I hadn’t been able to finish, the people I hadn’t manage to connect with, the sessions I couldn’t attend because I was in a brilliant parallel session. “How ungrateful you are”, I chided myself. “How ridiculous to have your whole day tainted by what you didn’t experience, rather than be amazed at what you did?” I spent some time before the second day began mentally preparing for the day ahead and taking my FOMO—now that I’d identified it—by the horns. I would aim to be present with the person right in front of me in conversation, to keep my eyes from flitting to the stream of people walking past behind them. I would take good notes in each session, and keep a record of the gems in front of me. I would keep my hands open, ready to receive every good gift that came my way, and ready to give generously if I had opportunity. The second day was so much better, and the third better yet. The practice of being present and attentive to the graces before me is something my FOMO-bent heart needs all the time, for I am strangely capable of missing out on the good thing right in front of me just because I’m scared of missing out somewhere else. I come home from the conference a little wiser about myself. I’m learning that the cure to FOMO is not to be found in being invited to all the things and attending all the events. It’s making sure I attend—with present, mindful, attention—to the place I am at. It’s not cured by physically showing up; for me it’s about emotionally and spiritually showing up in the conversation I’m having and the situation I’m in right now, without letting my heart and attention flit elsewhere. Our Fear of Missing Out will not be cured by receiving more invitations. Rather, God is inviting me—and you—to attend to the good gifts right in front of us, for He Fears we’ll be Missing Out if we don’t. Photo credit: Lilong Dolrani/ Lonely (Flickr Creative Commons), edited by Bronwyn Lea using Canva. ❤️ grateful to hear it. Very good insight here Bronwyn! I find that the best way to counter a negative behavior in me is to identify it. So bye bye FOMO!! 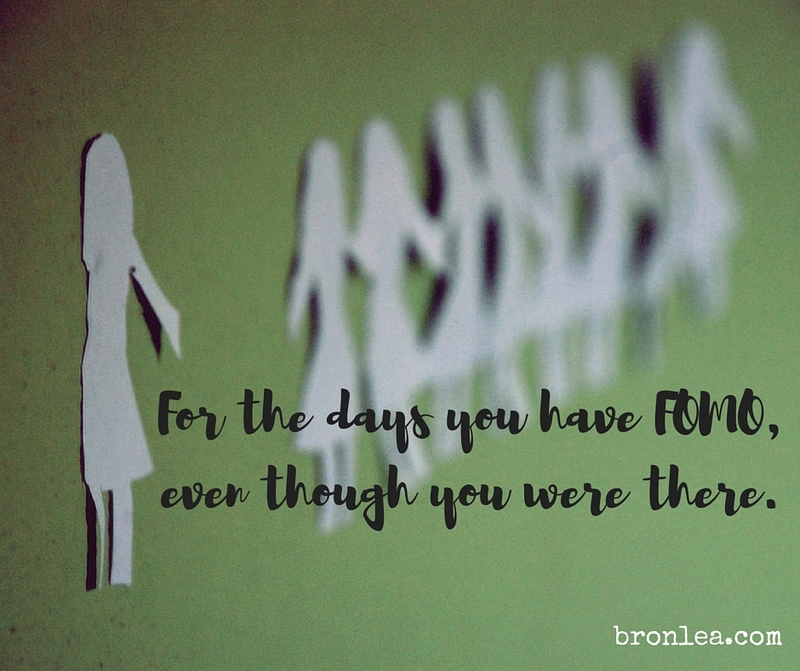 FOMO is a bit of a boomerang emotion for me: it keeps coming back… So I keep having to deal with it. I love that image of open-handedness — attentively receiving what’s in front of us and not looking around in hopes of something better. So helpful for all of life. I did totally envy you for being at FFW, though. 🙂 Since attending in 2010 I haven’t been able to go back — but someday!!! I wish you’d been there too! Wow, all that ink would cost you an arm and a leg… And it would be expensive!